In its Weekly Report On Israeli Human Rights Violations in the Occupied Palestinian Territories for the week of 26 January – 01 February 2017, the Palestinian Center for Human Rights (PCHR) found that Israeli forces continued systematic crimes in the occupied Palestinian territories. Israeli forces killed a Palestinian civilian in Jenin Refugee camp. 10 Palestinian civilians, including 2 children, were wounded this week. During the reporting period, Israeli forces killed a Palestinian civilian in Jenin refugee camp, north of the West Bank. Ten civilians, including 2 children, were wounded in the West Bank. In the West Bank, Israeli forces killed Mohammed Abu Khalifah (16) and wounded 4 others, including a child whose wound is serious and his brother. This happened when the Israeli forces moved into Jenin refugee camp to carry out an arrest campaign. A number of gunmen and civilians confronted the Israeli forces who in response heavily opened fire at them, killing the child and wounding other civilians. In addition to the above-mentioned wounded persons, on 26 January 2017, two civilians, including a child, were wounded in ‘Askar refugee camp, northeast of Nablus, when the Israeli forces moved into the camp and a number of children and youngsters protested against them. 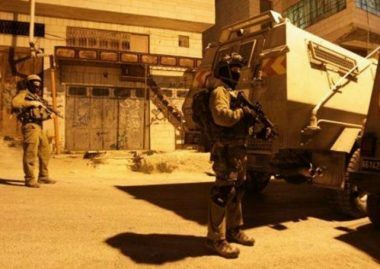 At approximately 01:30, Israeli forces moved into ‘Asker refugee camp, northeast of Nablus. A number of youngsters gathered and threw stones and empty bottles at the Israeli soldiers, who immediately fired rubber-coated metal bullets and sound bombs at them in response. As a result, a 17-year-old child sustained a metal bullet wound to the neck; and a 19-year-old civilian sustained a metal bullet wound to the head. In the meantime, Israeli soldiers raided and searched several houses and then abducted a 22-year old. On 27 January 2017, 3 civilians, including a child, were wounded in Jenin refugee camp, west of Jenin when Israeli forces moved into the camp and a number of children and youngsters protested against them. On 30 January 2017, Israeli soldiers stationed at Jubarah Military checkpoint, south of Tulkarm, opened fire at Yahiya Sarhan (19) and wounded him to his right foot. Sarhan was in his workplace which is nearby the checkpoint. During the reporting period, Israeli forces conducted at least 74 military incursions into Palestinian communities in the West Bank. During these incursions, Israeli forces abducted at least 43 Palestinian civilians, including a child. Six of them were abducted in occupied Jerusalem. In the context of house demolitions and notices, On 26 January 2017, Israeli forces demolished two Bedouin communities belonging to the family of ‘Arab al-Jahalin in al-‘Eizariyah village, east of Jerusalem. As a result, 8 houses and 5 barns were demolished, rendering 62 persons, including 39 children, homeless, in light of the cold winter weather. On the same day, the Israeli Municipality in Jerusalem handed Nihad al-‘Ababsi a summons to appear before its court. al-‘Abbasi said that it was the third time he received a summons to appear before the Municipality Court to issue decisions concerning a 70-square-meter structure he added to his house established 17 years ago. He added that he made the house wider 2 years and a half ago to add a bedroom for his children. Dozens of temporary checkpoints were established in the West Bank and others were re-established to obstruct the movement of Palestinian civilians. 6 Palestinian civilians, including 2 children, were abducted at military checkpoints. In the Gaza Strip, in the context of targeting Palestinian fishermen in the Gaza Sea, on 31 Janaury 2017, Israeli gunboats stationed off the north-western Gaza Strip shore heavily opened fire at Palestinian fishing boats, but no casualties were reported. Israel continued to impose a tight closure, imposing severe restrictions on the movement of Palestinian civilians in the Gaza Strip, including occupied East Jerusalem. Colonial expansion by force continued this week in the West Bank. Construction of new 3,000 colony units were approved, and ‘Amouna outpost was evacuated in exchange. 300 olive trees were uprooted from the lands of Kharas village, west of Hebron. On 26 Janaury 2017, Israeli forces uprooted 300 olive trees in Kharas village lands, west of Hebron. The 20-dunum land belongs to the heirs of Mousa Hamdan; around 200 members. They make their living from the olive corps. However, the Israeli authorities claimed that those trees were uprooted as the land is near the annexation wall in the area. In the context of escalating settlement construction in the West Bank, on Tuesday, 31 January 2017, the Israeli government approved building 3,000 new settlement units on grounds of evacuating “‘Amouna” settlement outpost. This came upon a statement published by the office of the Israeli Defence Minister, Avigdor Lieberman, in coordination with the Israeli Prime Minister revealing the approval on new settlement units. Israeli troops engaged in the excessive use of force against peaceful demonstrations protesting settlement activities and the construction of the annexation wall. Following the Friday prayer on Friday, 27 January 2017, dozens of Palestinian civilians and Israeli and international human rights defenders organized demonstrations in Bil’in and Nil’in villages, west of Ramallah and al-Nabi Saleh, northwest of the city, and Kafer Qadoum village, northeast of Qalqiliyah, protesting against the annexation wall and settlement activities. Israeli forces forcibly dispersed the protests, firing live and metal bullets, tear gas canisters and sound bombs. They also chased the protesters into olive fields and between houses. As a result, many of the protesters suffered tear gas inhalation while others sustained bruises as Israeli soldiers beat them up. Due to the number and severity of Israeli human rights violations this week, the PCHR made several recommendations to the international community. Among these were a recommendation that, in light of continued arbitrary measures, land confiscation and settlement activities in the West Bank, and the latest 51-day offensive against civilians in the Gaza Strip, the international community, especially the United Nations, the High Contracting Parties to the Geneva Convention and the European Union – in the context of their natural obligation to respect and enforce the international law – should use all available means to allow the Palestinian people to enjoy their right to self-determination, through the establishment of the Palestinian State, which was recognized by the UN General Assembly with a vast majority, using all international legal mechanisms, including sanctions to end the occupation of the State of Palestine.